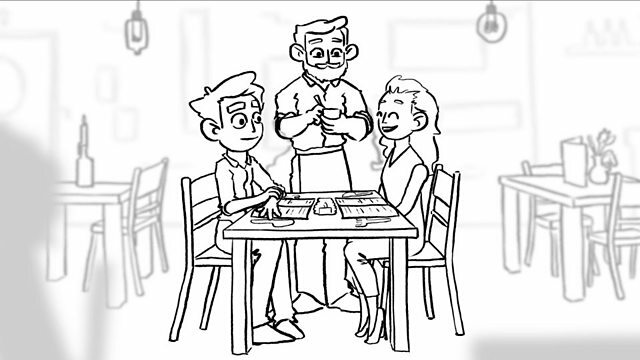 In this episode, Daniel is on a date with someone who shows a little too much interest in the waiter. What phrases does he use to move the conversation along? Watch the video to discover some key dating language. Very well. Sorry, you are Laura? Yes, yes. Sorry, I should have made that clear. She was very chatty. She came in. She had a big smile on her face. I mean, what more could you want? Should we get some drinks? That’d be great. Excuse me? Oh, I haven’t, I haven’t seen you here before. I’ve been here quite a few times. Sorry, yes. Two glasses of wine. Two glasses of white wine, absolutely. Coming up. Oh, no. It’s my pleasure! I wouldn’t say it was a good date. Well, she seemed a little bit more interested in the waiter than she did in me. Anyway, so what do you do for a living? There you are. Two glasses of white wine. Oh, thank you! That was so prompt. You’re obviously very good at your job. How long have you been doing it for? Oh, sorry you’re talking to the waiter. If anything, it got worse. She kept finding excuses to call him over. She wouldn’t stop looking at him. I felt like I wasn’t there. Oops, sorry you dropped your fork. Let me get that, let me get that. Let’s just find out. Excuse me? I’m so sorry to trouble you, would you mind… I dropped my fork. There you go, actually let me get you another one. This one’s dirty. That…thank you! That is so sweet of you. I’m sorry I’ve taken you away from another table, and you’ve come all the way here and picked up my fork. That’s not a problem. I’ll be back in two seconds. Thank you. That was nice, wasn’t it? And getting me a new one. That’s true, yeah. You did call him over. He came very quickly, didn’t he? Sorry? You just keep looking over there? I just thought I saw someone I know. Do you know what? Now you say it. It’s just the waiter, but I thought he was someone else I know, but he must just have one of those faces…very attractive faces. Oh… oh, I totally forgot. I’ve got to meet a friend. Yeah, I’m gonna have to run off. Sorry, I’ve double booked you. I’m really sorry. Erm… well I’ve still got all my food, so I might stay. I don’t think so, no if I’m honest. She’s not for me. Oh, I totally forgot. I've got to meet a friend! Laura said this when the waiter brought over the drinks. Which of the following did Laura say to compliment the waiter? Daniel said this towards the end of the date. Which of the following did Daniel say to make an excuse to leave? Laura said this when she dropped her fork. Which of the following did Laura say to politely ask for help? Join us in Session 22 to see Daniel go on another date in search of love!